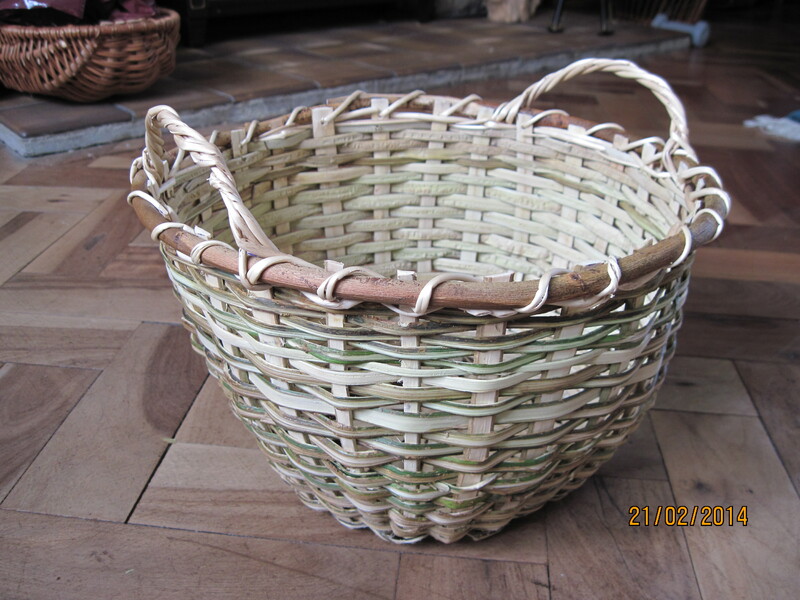 Last month I was lucky enough to attend 3 courses at the Schumacher college in Dartington, Devon the aim being to learn a variety of new and refined basketmaking techniques and skills. 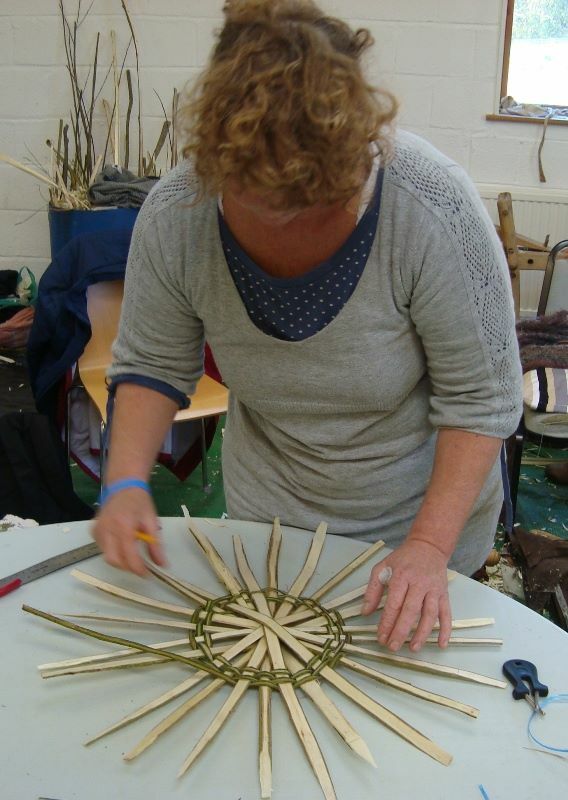 6 full days of basketmaking – what a fantastic prospect. The rain was lashing down but it didn’t stop me from being totally over excited as we settled into lovely little Hope Cottage in Totnes, roaring log fire and situated right next to the Ticklemore Cheese shop – what more could you want? This course was all about examining your current basketmaking practice and looking at ways to improve all aspects of your skills and techniques. We had to prepare our own willow for a round shopper and the first thing that Ian did was have a look at our willow and comment on our preparation. I had soaked and mellowed my favourite Flanders Red (2 different batches) and Dicky Meadows and also had some green Nigricans which had been cut before Christmas and which I thought was about ready to use. We had a really useful discussion about these and Ian manipulated the willow feeling the density of each rod and commenting on how one of the Flanders bundles was really hard and one was very pithy – we decided that was probably the growing conditions, one was from the Somerset Levels and one from the top of a mountain. The whole experience made me much more aware of the properties of my willow as I worked! We then had to crack on and start making our baskets in our normal fashion. I really enjoyed just having time to reflect on what I was doing and was relieved when Ian said my base was good enough to use. We learned a new method of weaving round bases using reverse pairing which overcomes a lot of common problems with a standard woven base. Ian also uses a ‘Beery Wale’ on all his baskets which is nothing to do with basketweaving when you get home from the pub but a method of extending the base on outstretched side stakes so that your spacing is already really even when you weave up the side of the basket. We watched Ian expertly lay down a border with a follow on and then had time to finish our own baskets. My finished shopper is far from perfect but I am very pleased with it nonetheless and feel my basketmaking has risen up a level since this course in terms of speed and neatness. Thanks Ian for sharing your extensive knowledge and expertise – and also for my lovely little Flanders shopper! I was really excited to be able to learn how to make a traditional Devon Fowl Crate, this course was taught by Hilary Burns. I have found that one of the best ways to learn new techniques is to study and copy old baskets but I had never seen anything quite like this one before! The basket is a 2 lidded oval basket made on an underfoot base with side rope handles, fitched sides with a decorative cross weave. Masses to learn and practice and the finally put together to make an authentic copy of the basket. We started by watching Hilary deftly make an underfoot base which is actually an incredibly quick and efficient method of starting the base and then subsequently weaving away. 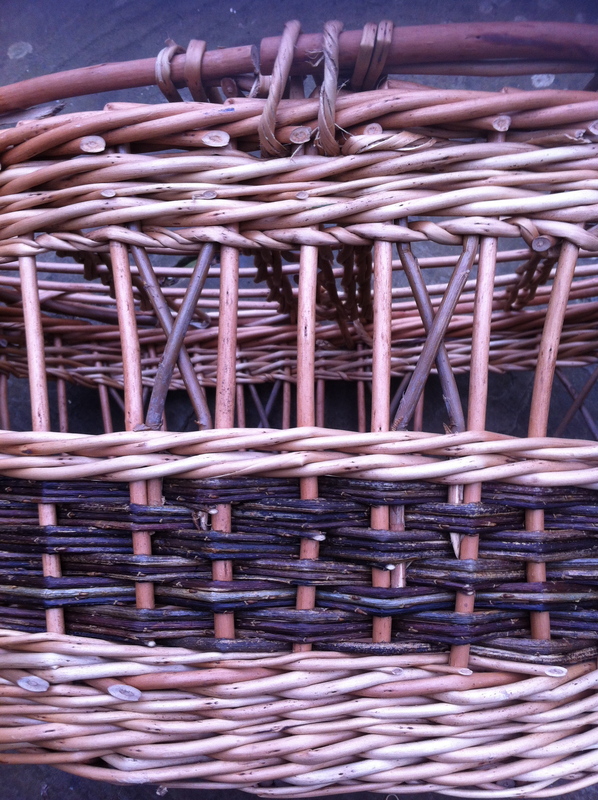 We worked with extremely chunky willow which gave good strong bases on which to sit our weaving. The sides were a combination of french randing and fitching with a pretty cross weave inserted below the border. 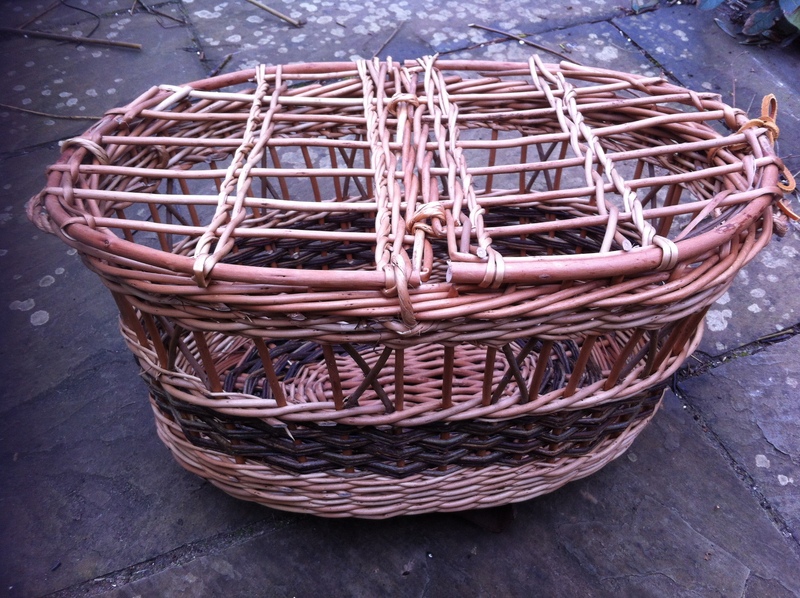 It was very interesting – as always the biggest challenge was to ensure the lids fitted the basket. These lids were different from anything I had tackled before as they are fitched to allow the hens to see out. Once the first one is made you have to match the second one to it. This was also at the end of a very long 2 days and I was just about to thread through my last scallom when my bodkin slipped and unhappily ended up in my hand – in that lovely soft bit between the thumb and forefinger. I hadn’t planned to test out the facilities there, but Totnes Minor Injury Unit is highly recommended! Luckily it was a quick patch up job as I wouldn’t have missed the last 2 days for the world. This was a quite amazing basket! 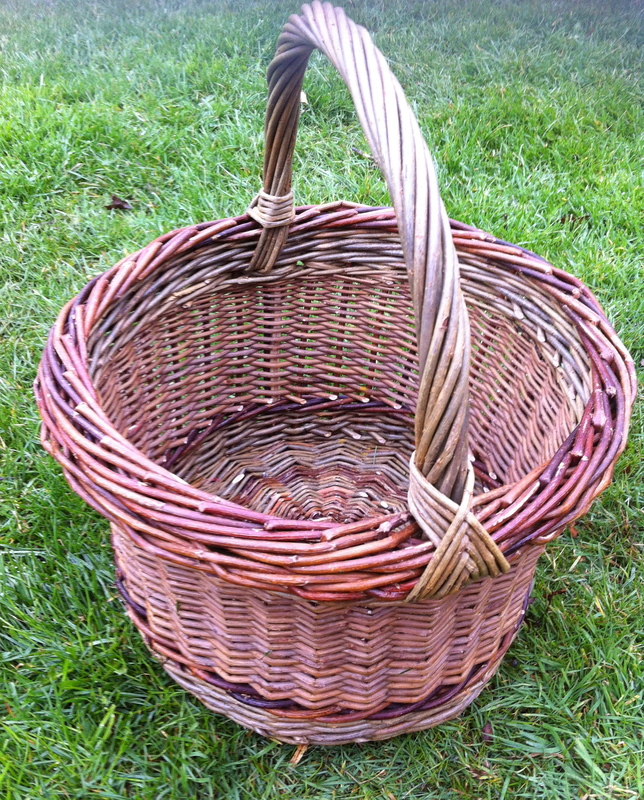 A copy of a beautiful old basket which was made by a travelling man named Tom and given to Geraldine – as I was making it I swear I could almost smell the woodsmoke from his caravan and hear the horses stamping around, very evocative. 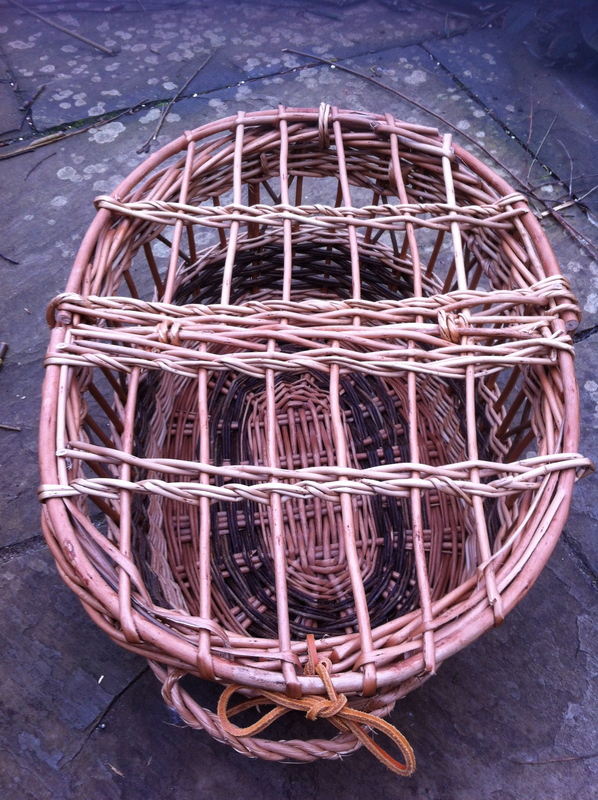 The two days were spent faithfully reproducing the basket which was made from split willow and bramble. It was fantastic just spending the first day practising splitting and shaving willow ribs with only a knife and billhook, until they were flat and smooth and of equal thickness – just wish I could have had a bit more laissez faire where the thickness was concerned and then perhaps I would have finished my basket. I can’t imagine Tom running each rib through his fingers to detect minute differences in thickness! The second day was spent splitting bramble into quarters and removing the pith to produce even skeins ready for weaving, again a wonderful job. We then had to construct the basket as shown in the photograph, bending the prepared ribs up to make a typical basket shape and weaving to keep everything in place, not easy at all. I am really glad Mary Ponting, our great friend and helper was there too to produce a beautiful finished basket for the photographs …. one day I will post mine on here as an update! It was a really wonderful 6 days, thanks to the Basketry and Beyond team for arranging such fascinating courses with such great tutors, so enjoyable …. It sounds like you had the best days. What fun. And to have a cottage near a cheese shop too!!!!!! I love the Devon Fowl Crate. I would love to make one. I wonder if someone has written a book on it.. I sure do wish I lived closer. Thanks for sharing your time I enjoyed hearing about all the wonderful baskets. Brill write-up, Clare! I’m still feeling envious about Ian’s course – you didnt tell me about the “beer” 🙂 ! But I thoroughly enjoyed being there on the Fowl Crate days with you – werent there some LOVELY baskets around! Cheers, see you another time…. Yes YOU would have really, really enjoyed that one Claire – sadly no real beer flying round on those days or your would have known about it, the wine in the night did the job perfectly though thank you very much! Yes hope to call in and see you sometime soon, watch this space ….